Max Holloway and Conor McGregor are poised to steal the show Saturday night in Boston at UFC Fight Night 26. 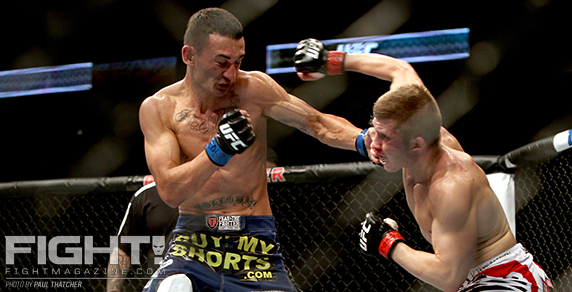 Over the last couple years, featherweight has become my favorite division to watch. Much like the lightweight ranks, the 145-pound weight class is loaded with talent, and just about every fight that hits the Octagon ends up being an entertaining affair. Those grumblings about the lighter weight fighters not being able to finish fights? Nonsense. Don’t believe me? Pull up a Cub Swanson highlight reel and enjoy eating crow. Saturday night in Boston, two featherweight prospects will share the cage in a fight that could potentially steal the show. While it’s not flying under the radar like some of the previous fights featured in this series, it is undoubtedly worthy of being deemed a Badass Beatdown. In my opinion, McGregor is the real deal—a fighter with championship potential, and the type of charisma that could make him a major star in the UFC very quickly. Yes, he’s getting a lot of attention for someone with just a single UFC win under his belt, but he’s won nine straight—all by way of stoppage, and seven of those in the first round—and looked every bit as good as his advanced billing when he took out Brimage back in Sweden. Holloway is no slouch, either. In fact, I actually think this is a tougher fight for the 25-year-old Irishman than his originally scheduled match-up with Andy Ogle. No disrespect to “The Little Axe,” but the Hawaiian is a superior striker and a much more dangerous stylistic match-up for McGregor. I think Holloway is a good test—a step up from Brimage, and someone who will help us get a better read on where McGregor’s ceiling rests. If the Straight Blast Gym student comes out and runs through Holloway the way he did Brimage back in April, then it’s time to give him an even tougher opponent next time out. If he wins, but has some struggles, we know it’s time to pump the brakes and pull back on the hype just a little. And if he loses, Holloway gets a major bump in recognition and replaces the brash Irishman as the up-and-coming featherweight striker to watch going forward. Holloway doesn’t strike me as the type of fighter who is going to be overwhelmed or unhinged by sharing the cage with someone who has been garnering as much attention as McGregor. He knows all the pressure is on his opponent, and that should allow him to be loose and fluid in this fight. There is a very good chance this turns into a 145-pound game of Rock’em Sock’em Robots, with these two talented prospects slipping punches and slinging leather in the center of the Octagon until one of them goes down. McGregor has the edge on the ground, but chances are he’ll look to keep it standing and put on a show for the crowd in Boston and everyone watching at home on Fox Sports 1. On a card full of potentially entertaining contests, this one is a front-runner for Fight of the Night, and will definitely carry on the proud tradition of the Badass Beatdown series.